Low Earth Orbit, an area of outer space around Earth that encloses all orbits below 2000 km, is the home of the International Space Station and of other thousands of satellites. It is also becoming a hazardous arena littered with mindless space junk and inoperable spacecraft orbiting at outrageous speeds. It’s a reality quite like Alfonso Cuarón’s film Gravity, and it’s called The Kessler Syndrome. If it plays out like the most pessimistic scenario, prepare to spend a few years without cell phone reception, Internet, and a five-day weather forecast. The Kessler Syndrome is a theory proposed by NASA scientist Donald J. Kessler in 1978, used to describe a self-sustaining cascading collision of space debris in LEO. It’s the idea that two colliding objects in space generate more debris that then collides with other objects, creating even more shrapnel and litter until the entirety of LEO is an impassable array of super swift stuff. At that point, any entering satellite would face unprecedented risks of headfirst bombardment. American astrophysicist Kessler published a paper in 1978 called the “Collision Frequency of Artificial Satellites: The Creation of a Debris Belt” which predicted that, by 2000, the density of space debris in Earth’s orbit would be so great that random collisions would be inevitable, and that the outcome of these random collisions would be more debris, and subsequently more collisions. At the time, scientists kept a catalog of human-made objects in orbit but did not update that list based on breakup events. Therefore, it was difficult to predict the volume of breakup byproducts—the debris too small to be detected by satellites. Kessler’s paper was significant because it emphasized the imminent danger of small debris in orbit as well as the inevitably of additional debris produced from collisions with catalogued objects. Kessler suggested the best way to avoid the exponential growth of the collisions was to reduce the number of non-operational spacecraft left in orbit. According to Kessler himself, his colleague John Gabbard of the North American Aerospace Defense Command (NORAD) coined the term “Kessler Syndrome” while explaining the paper to an eager-eared reporter; the reporter published the phrase, and the name stuck. 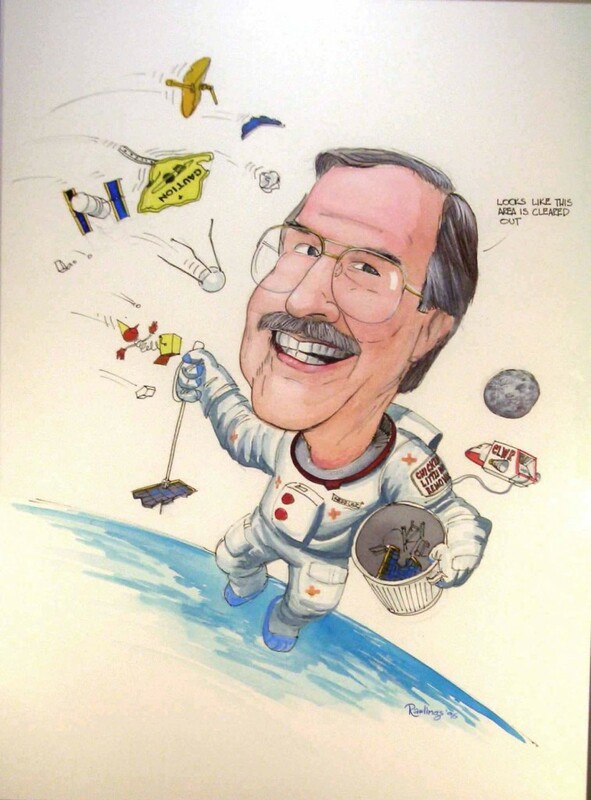 Don Kessler, in a 1996 caricature. – Image Courtesy: Don Kessler. Matter in orbit travels at ridiculously high speeds, like… 22,000km/h, just as an example. If this matter were to travel in the same plane and direction indefinitely, it would be impossible for any matter to collide, like cars going straight on a highway at the same speed, never endeavoring to switch lanes or get off on an exit. But in space, uncontrolled objects do nott follow a straight path. Instead, each piece of debris is subject to drift and decay. The variation in Earth’s gravitation field causes drift, or the gradual movement of an object to a different orbital plane. The friction of an object with Earth’s atmosphere causes decay, or the slow decrease in an object’s altitude. Live satellites can be repositioned using onboard thrusters to counteract natural drift and keep to their intended orbits, but dead ones? Those just keep on floating, unrestrained, drifting and decaying and, at any moment, knocking into other drifters. Earth’s gravitational field, here pictured as measured by NASA’s GRACE mission, presents deviations from the theoretical gravity of an idealized smooth Earth. Red areas present a stronger gravitational field, blue a weaker one. – Credits: NASA. But I Live On Earth, How Does the Kessler Syndrome Affect Me? Think you can live without satellite imagery that can aid in disaster relief and prevention and map climate change? Fine. What about that long distance phone call to your mother or that plane you (hadn’t yet) booked to visit her? Fine. But what about wireless Internet? There’s no doubt about it, a cascading collision of satellites in orbit would definitely affect life on Earth, by disrupting global communication, limit globalization and undermine military intelligence. Only Sandra Bullock and George Clooney would know what hit ‘em. Is The Kessler Syndrome Happening Now? In 2009, the operational Iridium 33 satellite collided with the defunct but intact Russian Cosmos 2251. The two satellites collided with a speed of 42,120 km/h at an altitude of 789 kilometers. The accident, called the Cosmos-Iridium collision, sent thousands of pieces of debris flying across an area populated by telecommunication and remote-sensing satellites, each piece drifting and decaying at a different rate, ramping up the probability for more collisions. While the accident illuminated the reality of in-orbit collisions, it so far has not sparked a series of them. But that doesn’t mean it still couldn’t. The fact is, Earth’s orbit is getting increasingly crowded with an estimated 500,000 pieces of space debris up to 10 cm long, more than 21,000 pieces of debris longer than 10 cm, and more than 100 million pieces of space debris smaller than 1 cm, according to NASA. That’s a lot to keep track of, and orbital debris researchers around the globe are doing the best they can to model and measure potential collisions. The U.S. Space Surveillance Network catalogs artificial objects orbiting Earth, and at NASA’s Johnson Space Center in Houston, Texas, scientists in the Orbital Debris Program Office conduct ground-based and space-based observations of the debris using radars, telescopes and data returned from spacecraft. They also have a modeling team that uses software to measure current and future impact risk. Still, the task is daunting, and even the most rigorous calculations are subject to error. – In the video below, distribution of debris following the Cosmos-Iridium collision. What Can Trigger The Kessler Syndrome? In 2002, the European Space Agency launched an eight-ton satellite named Envisat featuring atmospheric sensors, advanced imaging radars and spectrometers that monitored Earth’s land, oceans, atmosphere and ice caps. It was the largest Earth observation satellite ever built. And, as of April 2012, it became the largest inoperable satellite in LEO, rendering it one of the greatest threats for collision. “Envisat is a very large target, operating at an altitude where the debris environment is the greatest and likely to increase. In the next 150 years that the satellite will remain in orbit, it will become a significant debris source and could easily become a major debris contributor from a collision with debris as small as 10 kg,” said Don Kessler in a 2012 Space Safety Magazine interview. Unexpected loss of satellite contact, as happened with Envisat, is not a rare occurrence in LEO, where solar storms can disrupt and damage satellites and electronic failures can severe ground communication. In some cases, like Envisat, re-establishing contact is impossible and the useless satellite becomes dangerous dead weight, orbiting aimlessly. What If it Has Already Started? Kessler’s Syndrome refers to a cascading effect of colliding debris creating additional debris and additional collisions, but time frame is not inherent to the model. This means that the Iridium-Cosmos collision in 2009 could have ignited the process, kind of like a “Patient Zero,” though it’s been slow-to-burn. Scientists say the Iridium-Cosmos collision produced more than 2,000 pieces of debris measuring at least 10 cm in diameter and thousands of smaller pieces. Although additional major collisions have not been reported since that February day, it could just be a matter of time. Artist depiction of rocket body explosion. An event of this nature can be prevented by releasing all the stored energy from inside a rocket, a process known as “Passivation.” – Credit: ESA. Where Can I See A Down-To-Earth Representation Of The Kessler Syndrome? The Kessler Syndrome, though still largely unknown to the general public, has wiggled its way into media and pop culture. Just look at the 2003 work “Planetes,” a top-rated Japanese manga and anime series, set in 2075 featuring space debris collectors as the main characters. The show serves science well, accurately portraying the possibility of astronauts suffering from radiation poisoning, cancer, brittle bones and mental illnesses; realistically depicting a weightless and vacuum environment; and portraying the thrust required to change orbits in space. The manga received a Seiun Award for best science fiction series. Then, of course, there’s Gravity, nominated for 10 Academy Awards and the Best Picture of the Year by the Producer’s Guild of America. The story follows two astronauts whose space shuttle is destroyed by space debris during a repair mission to the Hubble Space Telescope. With increasing demand for telecommunication, remote sensing, and other satellite applications, we can expect The Kessler Syndrome to make its way into more headlines and pop culture. After all, it’s not going anywhere, at least no faster than we’re developing ways to suppress it. The first thing is to reduce or stop unnecessary harmful activities. Here on Earth, we—as a human society—litter our cigarette butts and toss plastic bottles out windows. At the very least, we produce tons of trash because it seems easier than recycling and reusing. We throw it out and forget about it, because really, who needs that added guilt or responsibility when that milkshake (plus cup, lid, and straw) tastes so good? Space is no different. We tend to think of space as infinite, as free, so enormous as to be beyond our comprehension. We think of it as outside of ourselves and outside of our reality. Whatever we toss out will find its own way, right? It’s not a part of us, anymore, at that point. It’s alien stuff. Unfortunately objects in LEO don’t just disintegrate the second we toss them out. They get “stuck” in orbit. The only way to remove them is to do just that—actively remove them. To clean up LEO and prevent unnecessary litter in the future, we need to think smarter. That means releasing rocket stages at suborbital or very low LEO altitudes to allow the discarded portion of the rocket to fall back to Earth rather than ending life in orbit. To prevent debris-creating explosions (oh yeah, that can happen too…), their remaining fuel should be vented. – In the video below, an ESA documentary about space debris and the Kessler Syndrome. And What About Existing Satellites? 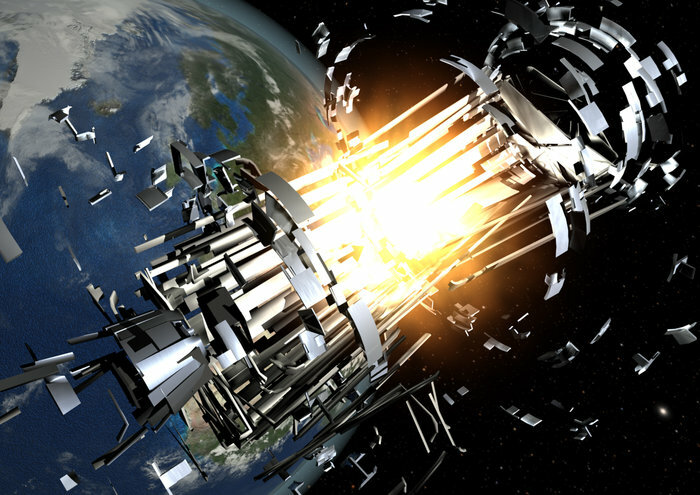 Several methods have been proposed to take care of the thousands of fragments orbiting Earth, like lasers, tugs, drag enhancement devices, momentum exchange tethers, and more, and the 2010 National Space Policy of the United States directed NASA and the Department of Defense to pursue additional research efforts to remove debris. Unfortunately, the cost and complexity – not to mention legal concerns – have so far prevented the proposals from becoming reality. In simple terms: the situation is really serious, but no more dramatic than life and death. We know the potential for a catastrophic spacecraft collision just as we know the equally catastrophic potential of pollution here on Earth. And while we explore measures to improve it, we carry on, hoping for the best.